Angular pipes take data as input and transform it to your desired output. For example, using interpolation you are displaying name of the product. Now you want the product name always displayed in the uppercase. You can do this using Angular pipe uppercase. Let us see how we could use the built-in currency pipe. Even though Angular provides many default pipes, there could be requirements when you create custom pipes. Creating a custom pipe is very as simple as creating a function. Let us say that we want to create a pipe, which will capitalize first letter of each words in a string. As you see, custom pipes are nothing but a function which takes input parameters, and returns some value. You need to write all logic of the pipe inside transform method. Now you will get in output the first character of each name in the uppercase. It should implement pipe business logic inside transform method. What we used and created above are stateless pipes. They are pure functions, which takes an input and returns transformed values. Stateful pipes are complex to implement and they remember state of the data they transform. Usually they create an HTTP request, store the response, and display the output. Angular inbuilt async pipe is example of stateful pipe. In further posts, we will learn to create custom stateful pipes. In this post, we learned about pipes in Angular. Pipes transform an input data to desired output. Angular provides many built-in pipes; however, there could be requirements to write custom pipes. There are two types of pipes: stateless pipes and stateful pipes. And there you have it! If you like this post, please share it. 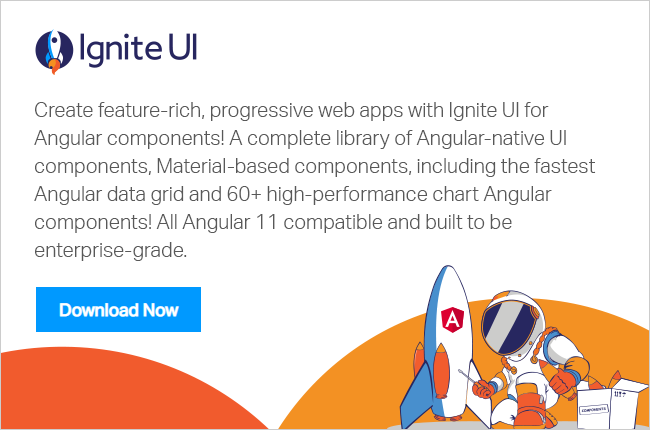 In addition, if you haven’t checked out Infragistics Ignite UI for Angular Components, be sure to do so! They’ve got 30+ material based Angular components to help you code speedy web apps faster.